JACKSON, Miss. 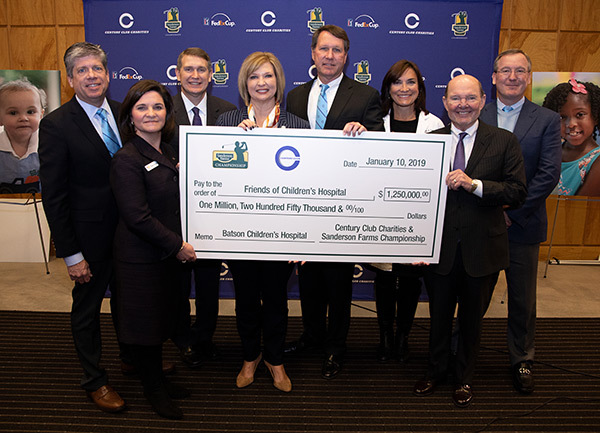 (January 10, 2019) – Century Club Charities, host organization for the Sanderson Farms Championship, presented a $1.25 million gift to Friends of Children’s Hospital this morning. Also during the event, Century Club Charities presented a second gift to FOCH for $125,000, with $100,000 through Mac Elliott in memory of Sidney Allen, Sr., former Board Chairman of Friends of Children’s Hospital, and $25,000 in other designated donations. Today’s announcement, made to a standing-room-only audience at the Norman C. Nelson Student Union at UMMC, was the culmination of a year of hard work, said Joe F. Sanderson Jr., CEO and Chairman of the Board of Sanderson Farms. “We work 12 months to get to that eight days of the Sanderson Farms Championship,” he said, “and all of that is about today and for the next 40 years. It’s about this new pediatric expansion and the physicians, nurses, families and children who will be cared for there. The Sanderson Farms Championship (Jackson, Mississippi) was honored by the PGA TOUR at the TOUR’s Tournament Meetings on December 6. The Sanderson Farms Championship earned an award for “Best Charity Integration” during the 2018 tournament at The Country Club of Jackson. The “Best Charity Integration” Award recognizes the tournament that incorporates the tournament’s charity and theme into all facets of the event. Through onsite activation, year-round community initiatives and title sponsor engagement, the Sanderson Farms Championship is united around its charitable impact to Friends of Children’s Hospital, a non-profit benefiting the only children’s hospital in Mississippi, Batson Children’s Hospital. The Sanderson Farms Championship won the award for Best Charity Integration among all PGA TOUR tournaments last night at the PGA TOUR’s annual Tournament Awards Dinner. The other finalists were the Honda Classic and the AT&T Pebble Beach Pro-Am. The award is given to the tournament that best incorporates their charitable goals into the tournament. Batson Children’s Hospital is highly visible onsite during tournament week with patients, doctors and nurses greeting spectators at the main entrance. Branded elements such as tickets, signage, tee markers and client badges also help deliver the charitable message. Additionally, the televised message in the tournament broadcast typically reserved for the title sponsor CEO is instead presented by a hospital executive. 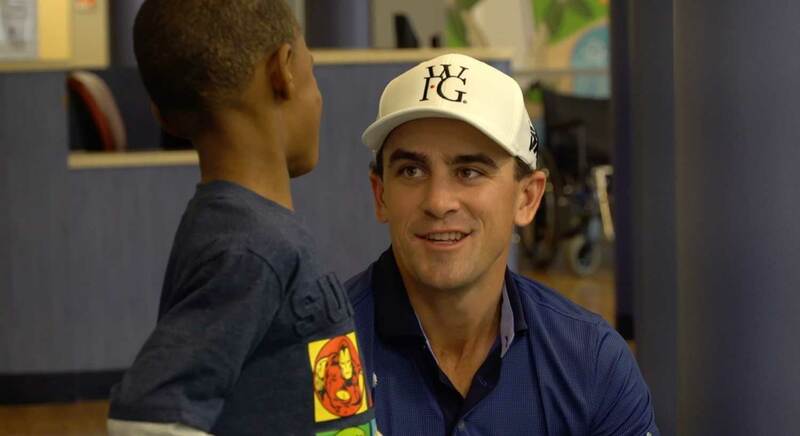 At the 2018 event, PGA TOUR players made time to visit and interact with sick children at the hospital while highlighting the tournament’s charitable endeavors. Keynote speakers Erin and Ben Napier from HGTV’s “Home Town” also presented awareness of the charitable initiative during Tuesday’s Women’s Day Luncheon, while members of the PGA TOUR Wives Association hosted a party for patients at The Country Club of Jackson. In 2017, more than $300,000 was donated to local charities across the state, in addition to a record breaking $1.2 million donation to Friends of Children’s Hospital. Tournament proceeds will fund construction of a seven-story, 340,000-square-foot pediatric tower that will be home to 88 private neonatal intensive care rooms, 10 additional operating rooms, more pediatric intensive care space, a pediatric imaging center, an outpatient clinic and a new lobby. Sanderson Farms Inc. CEO Joe Sanderson, and his wife Kathy, are chairs of the $100 million fundraising campaign and personally pledged $10 million over the next five years. The PGA TOUR co-sanctions more than 130 tournaments on the PGA TOUR, PGA TOUR Champions, Web.com Tour, PGA TOUR Latinoamérica, Mackenzie Tour-PGA TOUR Canada and PGA TOUR Series- China. Members on the PGA TOUR represent the world’s best players, hailing from 25 countries (88 members are from outside the United States). Worldwide, PGA TOUR tournaments are broadcast to more than 1 billion households in 226 countries and territories in 23 languages. Virtually all tournaments are organized as non-profit organizations to maximize charitable giving. In 2017, tournaments across all Tours generated a record of more than $180 million for local and national charitable organizations, bringing the all-time total to $2.65 billion. 2018 proceeds from the Sanderson Farms Championship will go towards the expansion efforts happening at Batson Children’s Hospital. The new medical tower underway will be a seven-story, 340,000-square-foot pediatric tower, home to 88 private neonatal intensive care rooms, ten additional operating rooms, more pediatric intensive care space, a pediatric imaging center and an outpatient clinic. Joe and Kathy Sanderson are chairs of the $100 million fundraising campaign and personally pledged $10 million over the next five years.